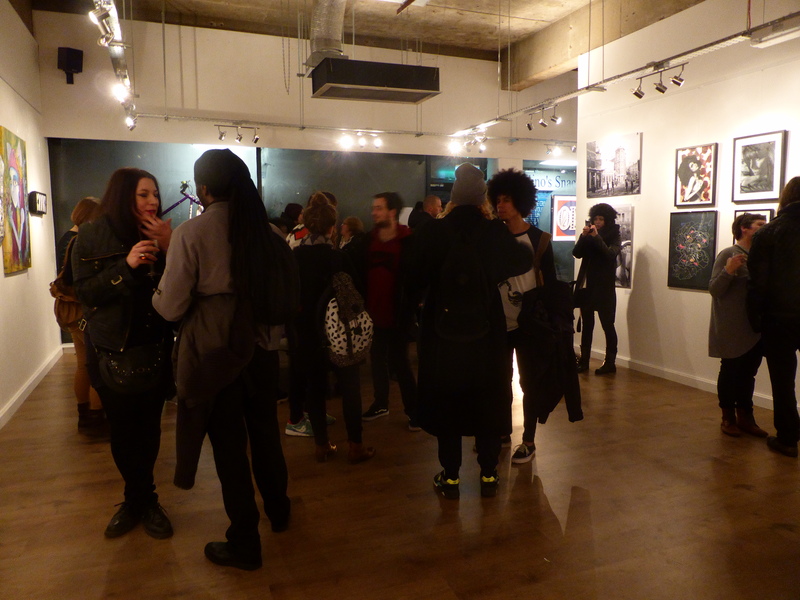 Last night was the private viewing for the Femme Fierce Takeover exhibition at in Croydon’s Arts Quarter and what a show it is. 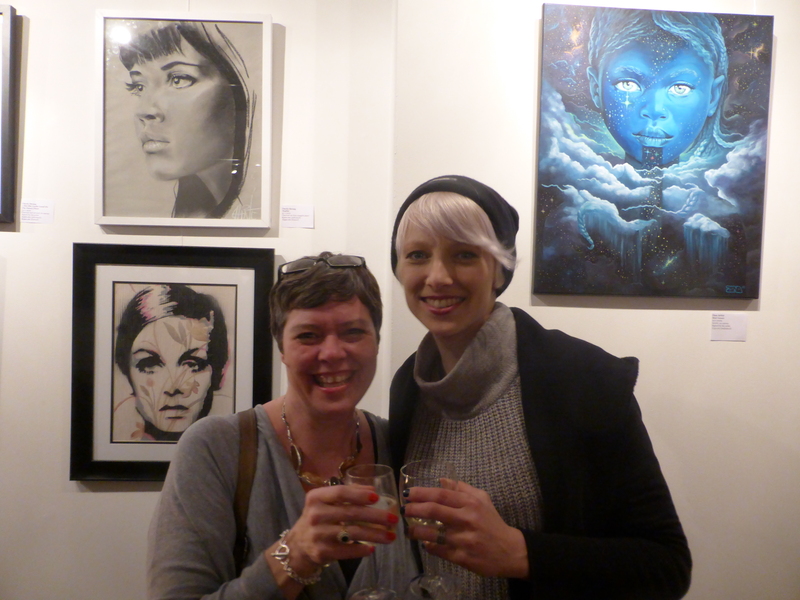 Less than a fortnight from Femme Fierce Croydon hitting the streets in and around St Georges Walk a group show of all female artists, all set to take part in Femme Fierce Reloaded, was unveiled. 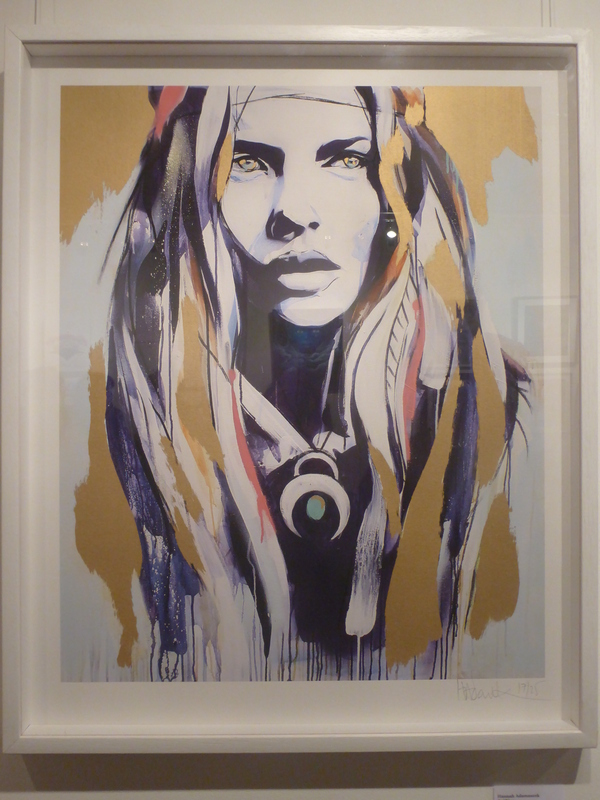 There are some 33 pieces of art on display and available from a total of 17 artists, making for a broad range of artistic capability, presented in and on a variety of mediums, setting forth an all round great exhibition. We are now going to share some of our pictures of the great works on display as well as the general festivities of the evening. Unfortunately due to the fact that some of the pieces were displayed behind glass frames, making it very difficult to get clear pictures of the pieces, I am going to focus primarily on the canvas based pieces that were on display. If you like what you see be sure to head along as there is much more great art on display other than what I am showcasing here, not to mention the other sets of works currently on display in the second half of the gallery. 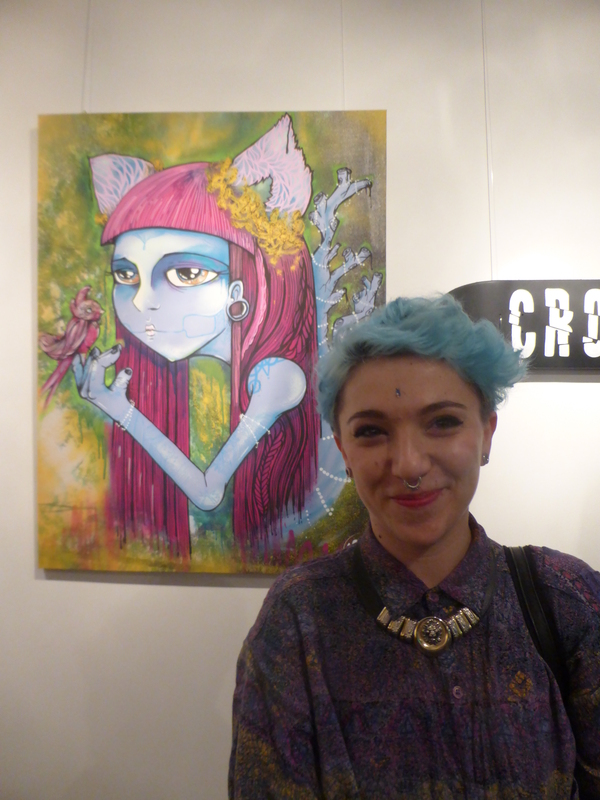 Elno standing in front of one of her pieces in the exhibition. 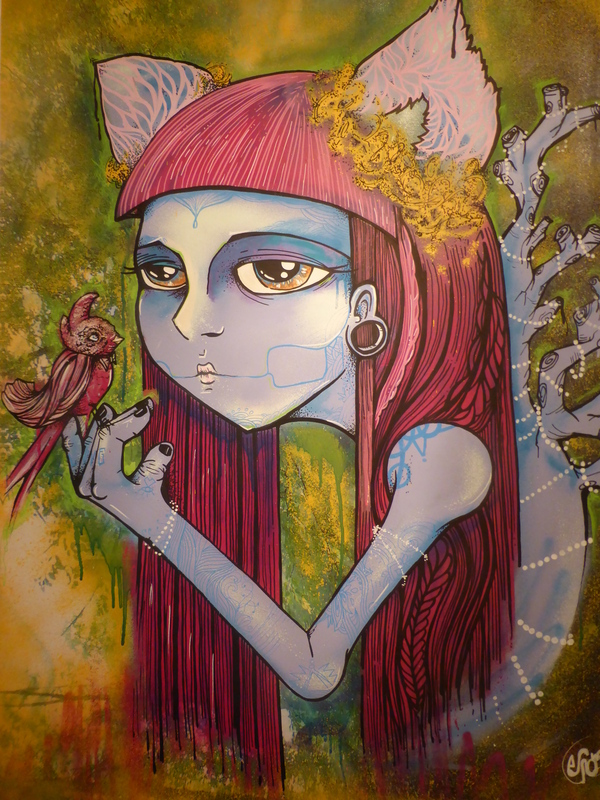 Elno – Magical Being Of The Forest – Acrylic on canvas. 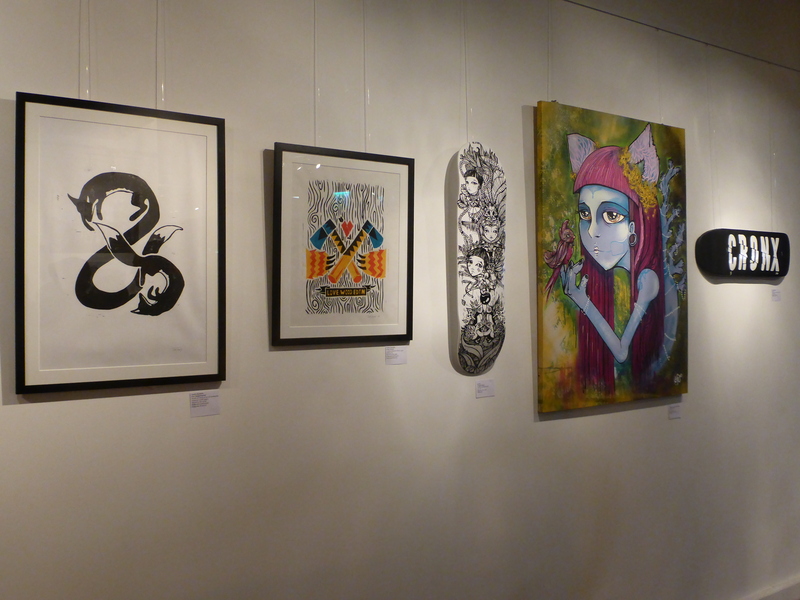 Works from Toria Jaymes & Elno. 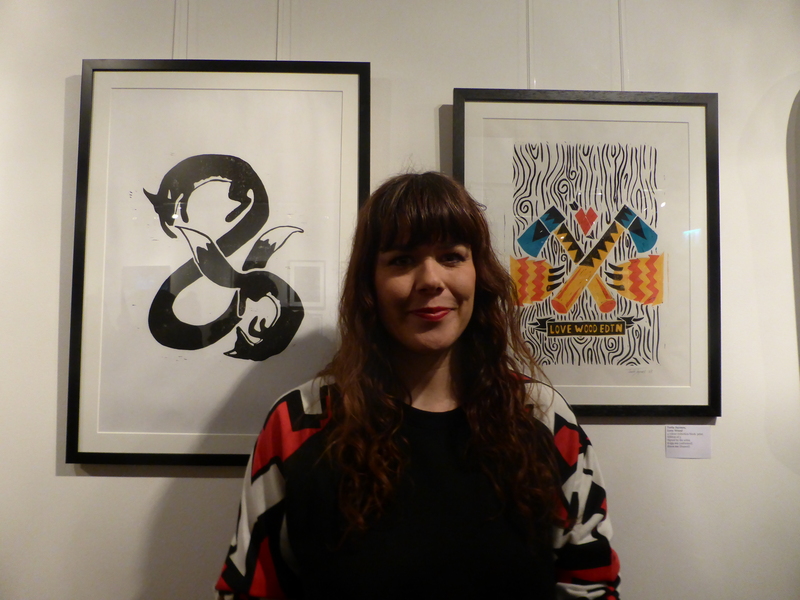 Toria Jaymes standing with two of her woodcuts in the show. 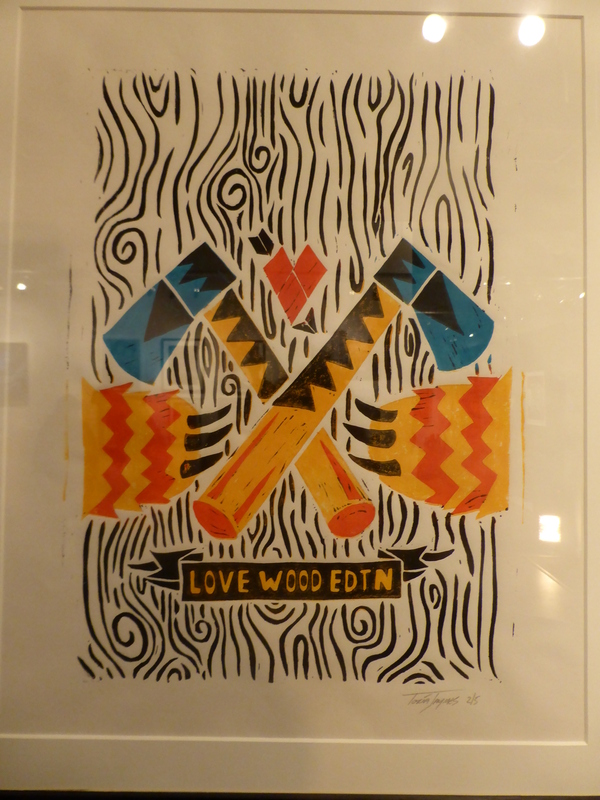 Toria Jaymes – Love Wood – 4 colour reduction wood print. 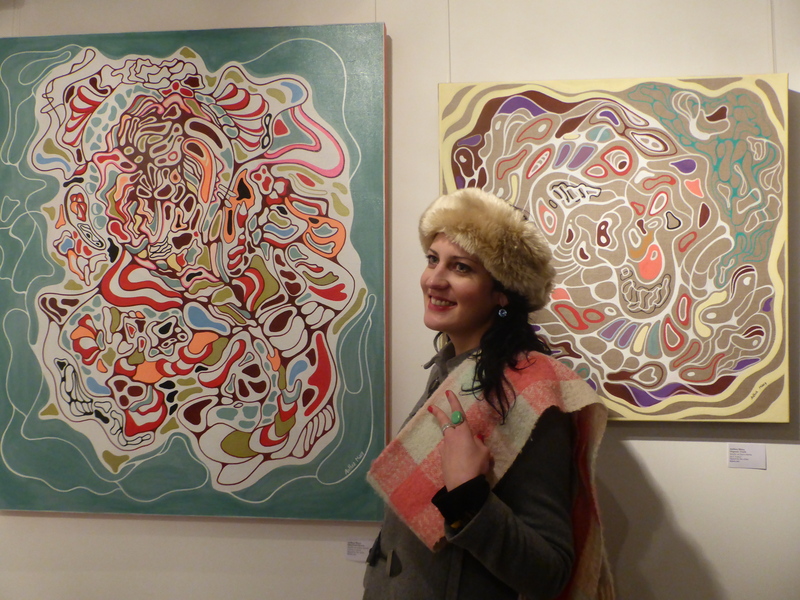 Giusi Tomasello with three of her four contributions to the exhibit. Giusi Tomasello works. 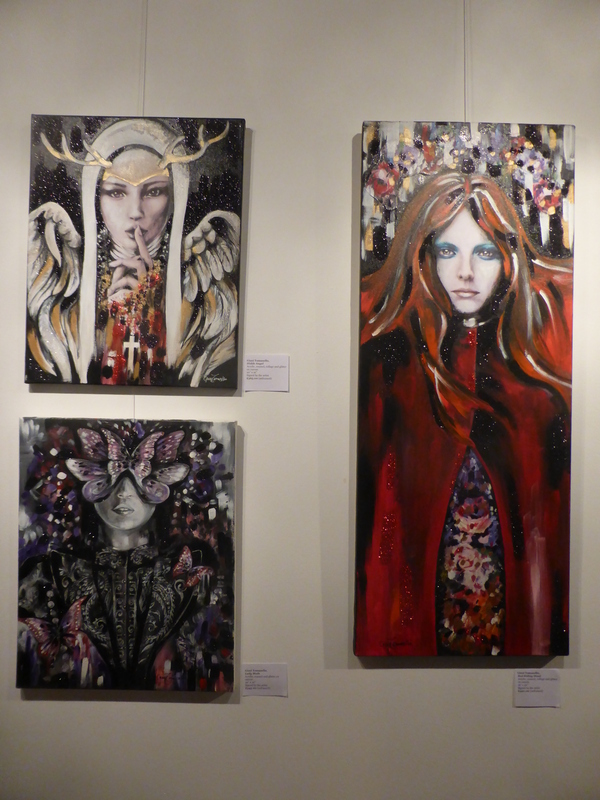 Some of my favourites of the exhibition. 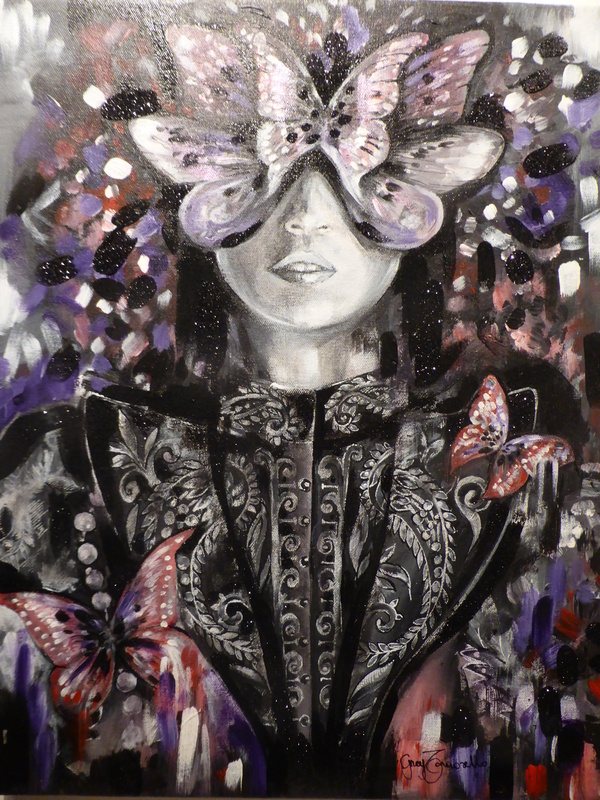 Giusi Tomasello – Lady Moth – Acrylic, enamel and glitter on canvas. My favourite pieces of Giusi’s on display. 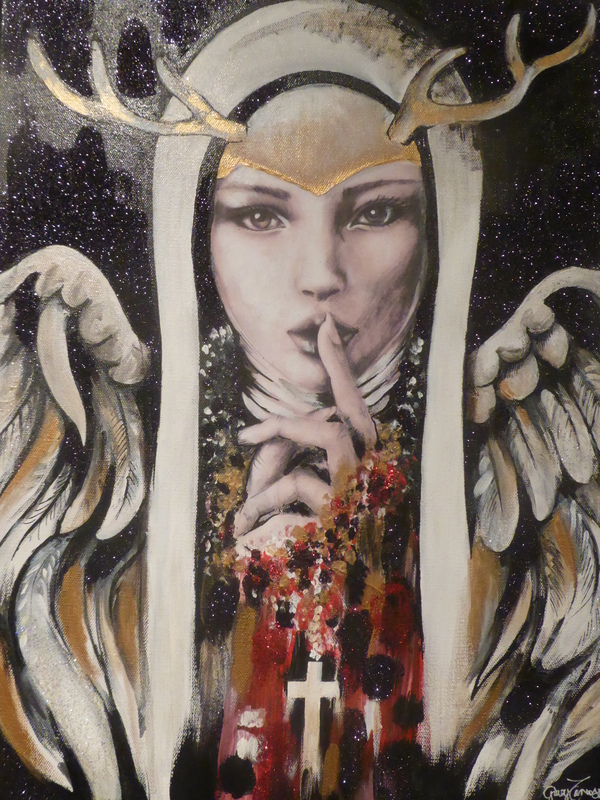 Giusi Tomasello – Hidde Angel – Acrylic, enamel, glitter and collage on canvas. 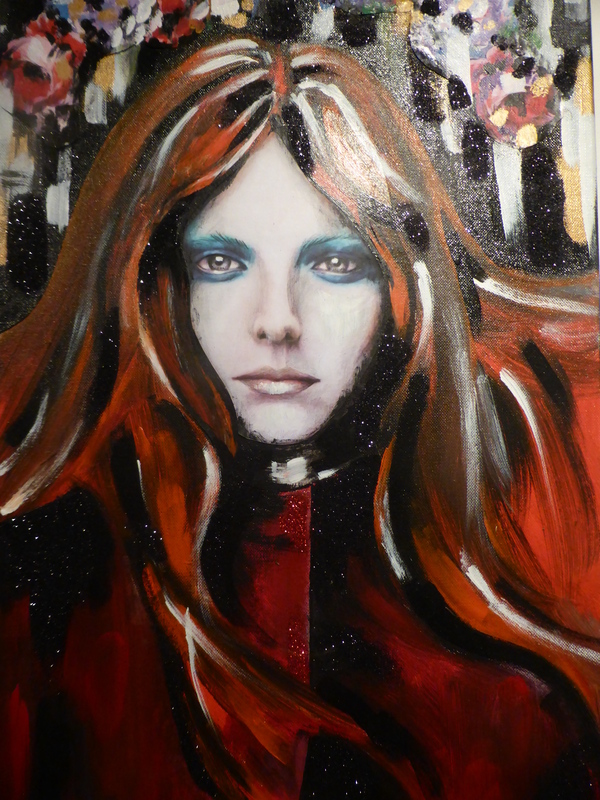 Giusi Tomasello – Red Riding Hood – Acrylic, enamel, glitter and collage on canvas. Hannah Adamaszek – Drifting – Giclee print with silk screen print overlay. 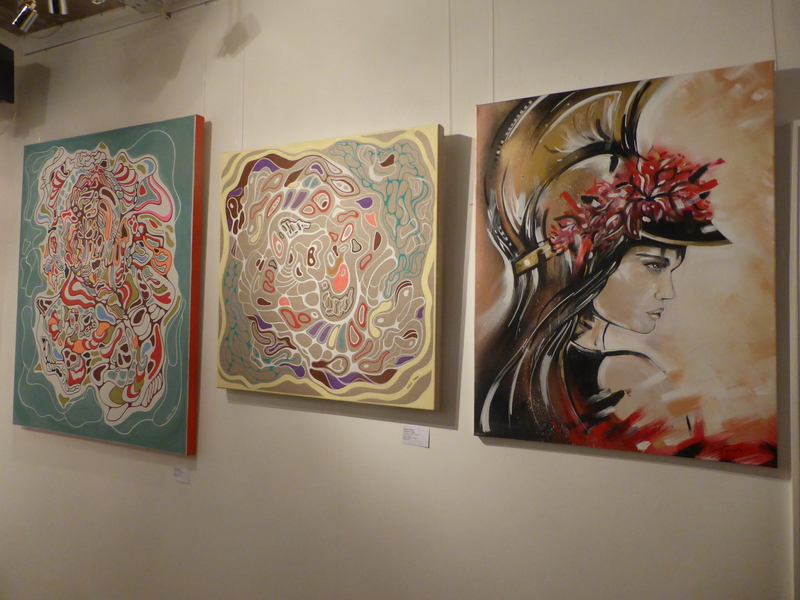 Works from (left to right) Maggio, Chewy Amelia, Roo & Hannah Adamaszek. 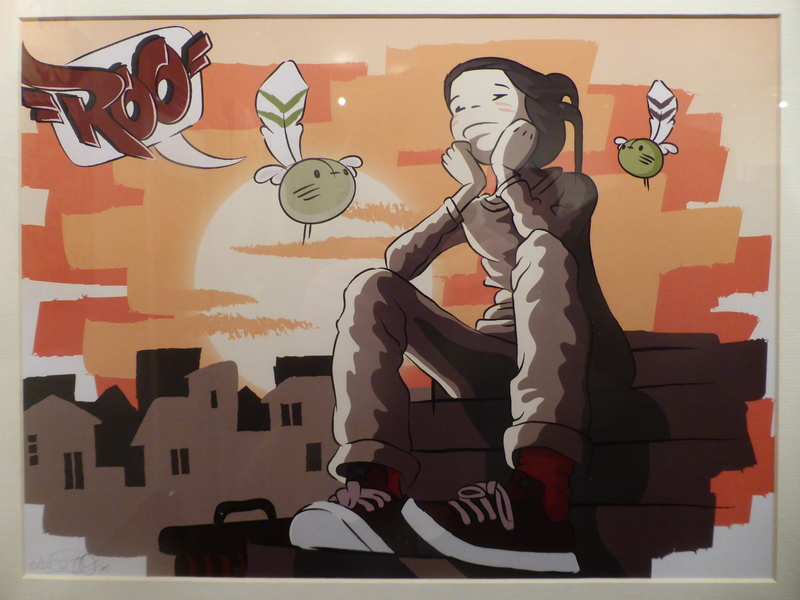 Roo – Ding Mei Ling – Digital print. Carolina Maggio – Antimatter – Acrylic on canvas. 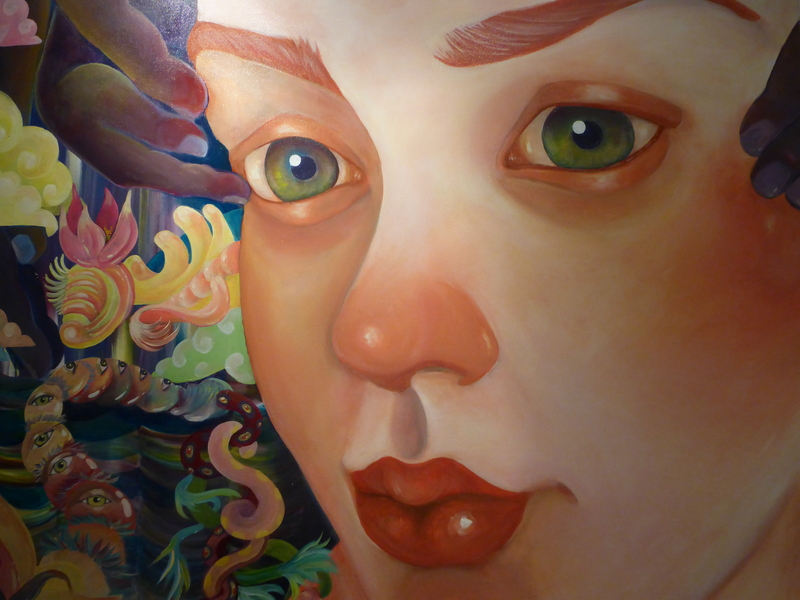 Close up of Maggio’s piece. Another highlight of the show for me. 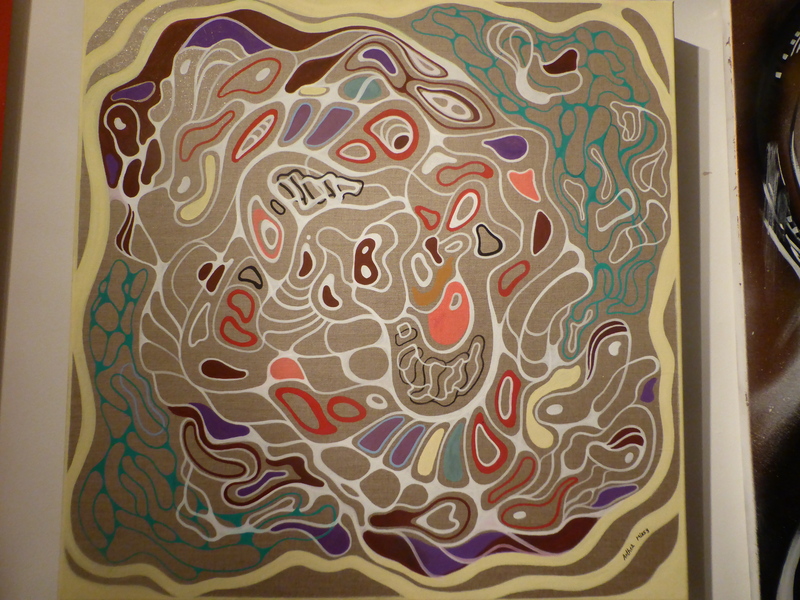 Two works from Anthea Missy and a large canvas piece from Giusi Tomasello. 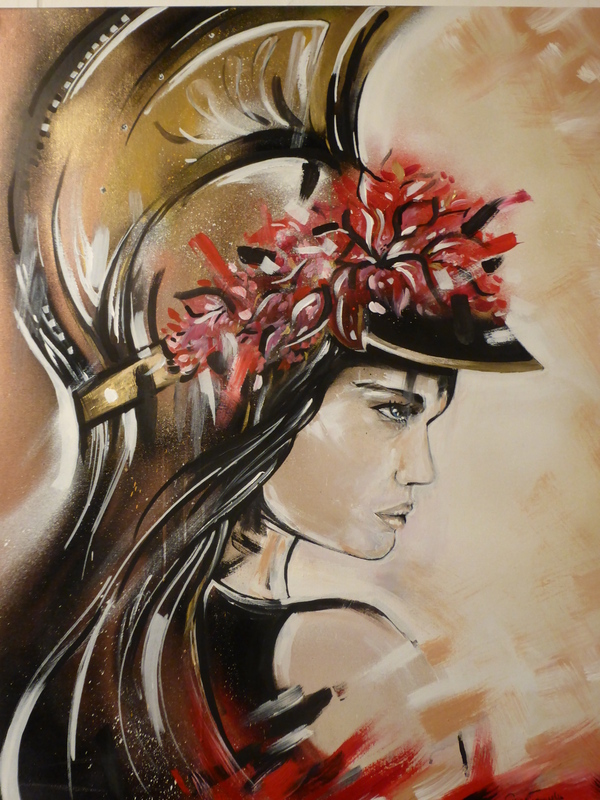 Giusi Tomasello – Piece based on her Femme Fierce Croydon work currently on Park Street – Acrylic & enamel on canvas. 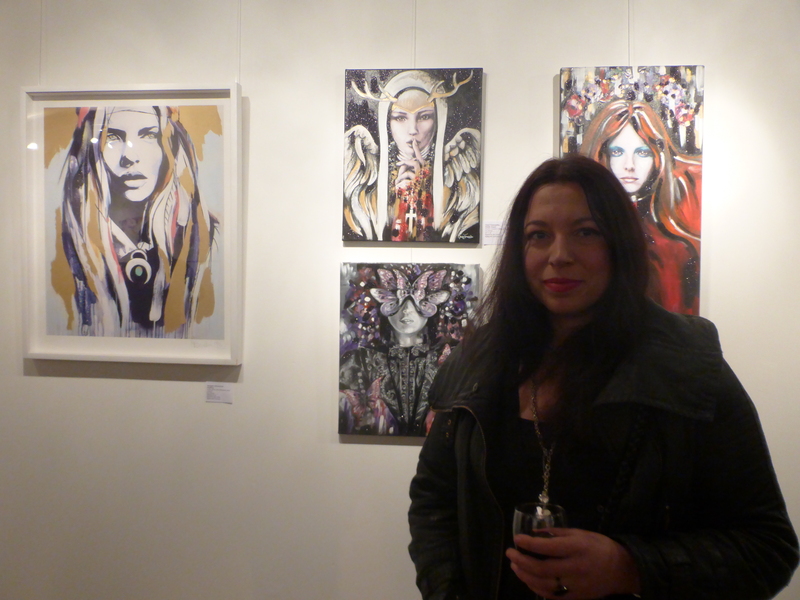 Anthea Missy with two of her three pieces on display. 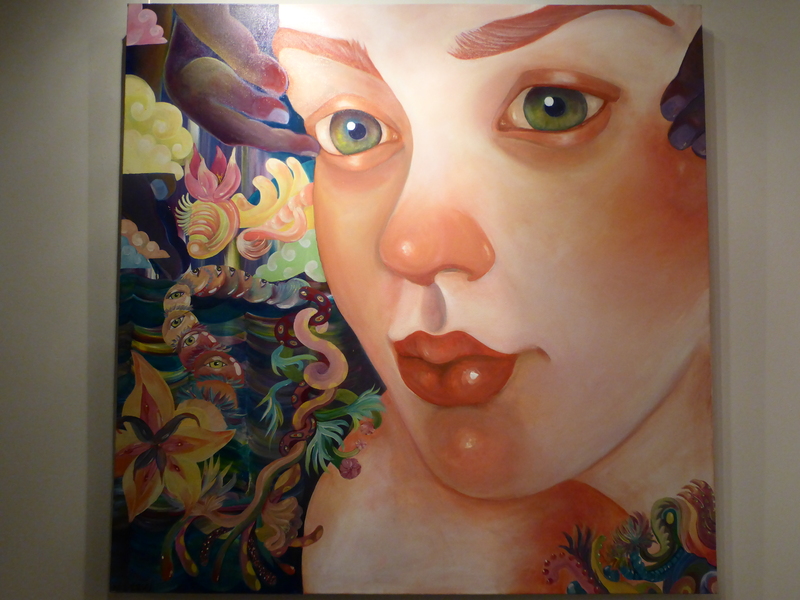 Anthea Missy – Organic Truth – Acrylic on canvas. Anthea Missy – Electrical Storm – Acrylic on cotton canvas. 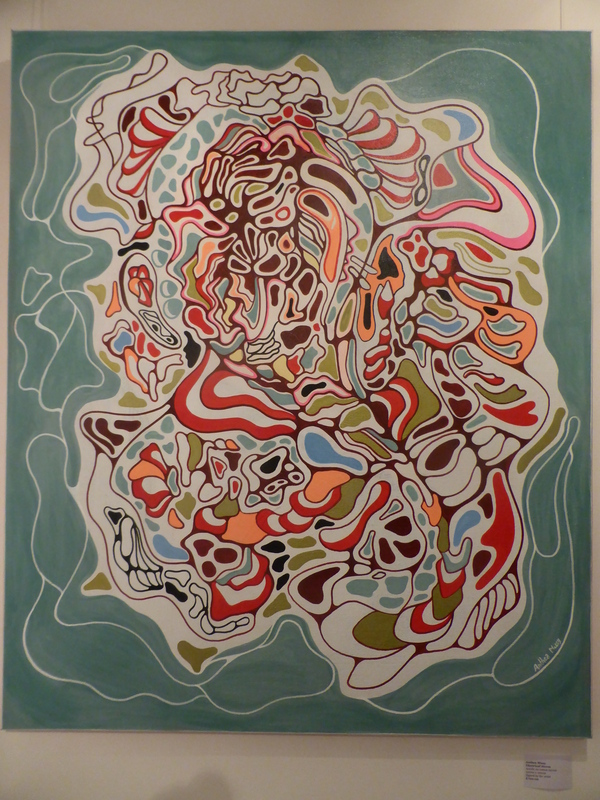 This piece is great, so much going on. Stephanie K. Kane – Half Of Dope – Crayons & gloss on sanded wood. Lisart & Zina standing between their respective contributions to the show. 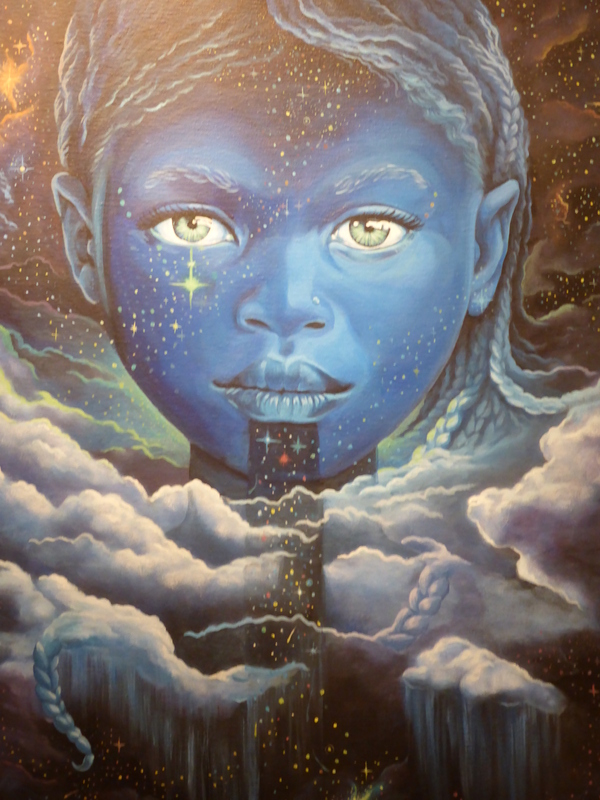 Zina – Star Gazer – Acrylic on canvas. 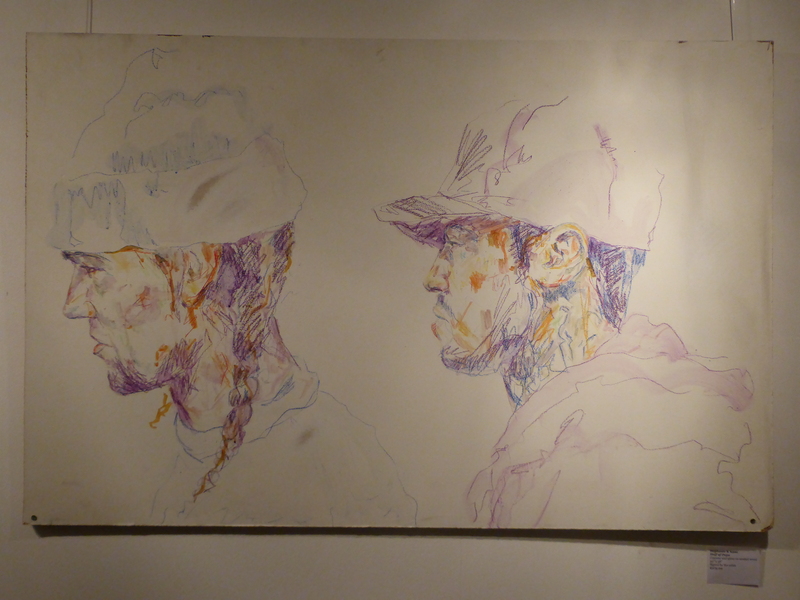 This was my favourite piece in the show. 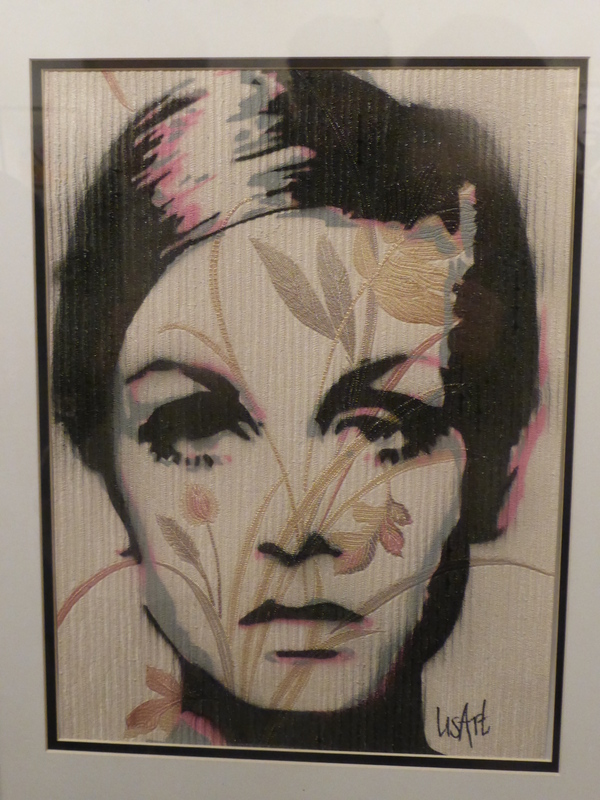 Lisart – Twiggy On Wallpaper – Spray paint on wall paper. 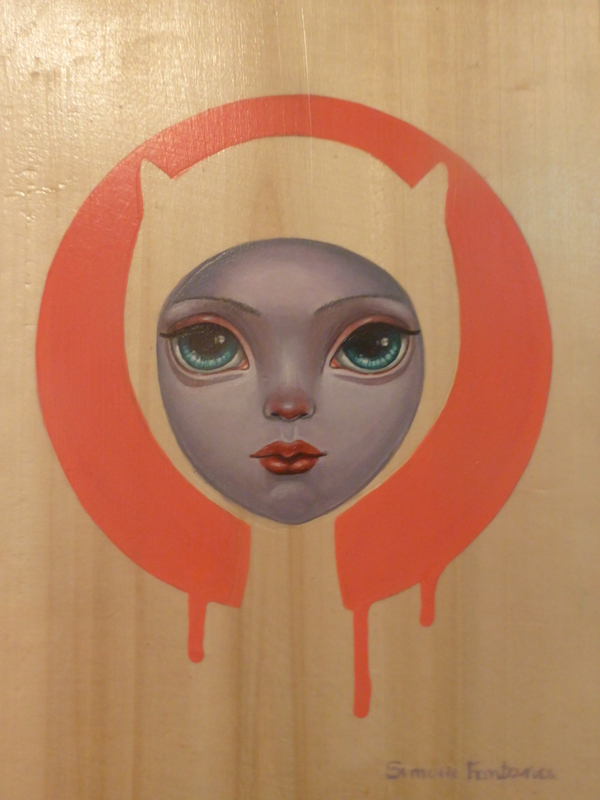 Simoni Fontana – Pink Dot – Acrylics on wooden canvas. 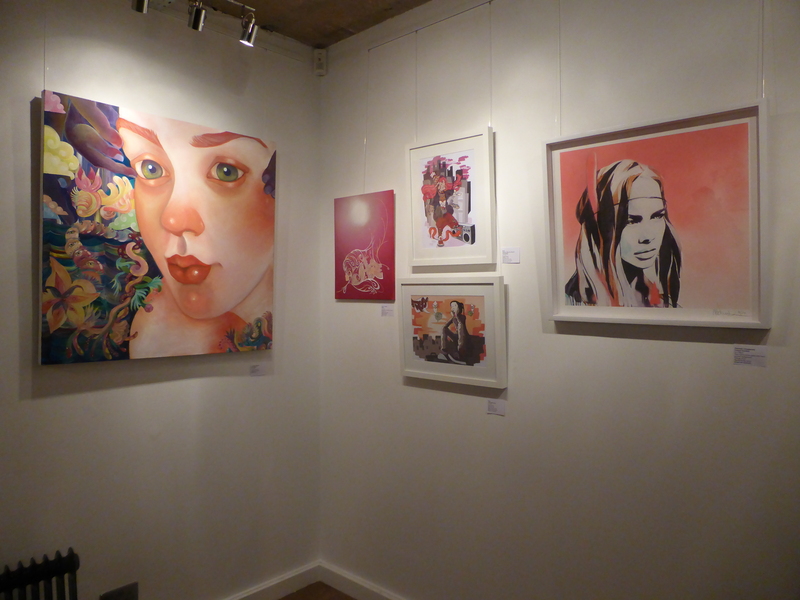 The exhibition runs until March 30th and all of the artists in this exhibition will be appearing at Femme Fierce Reloaded on March 8th at Leake Street. I can’t stress enough how great an event this is gonna be and if you can make it along, be sure to do so. Top Greek street artists Simoni Fontana, Mariana Cute & Cleo43 prepare to hit the Banksy Tunnel for Femme Fierce. Femme Fierce 2015 launches with a kickstarter campaign and promises to be bigger than ever.